The second largest city in the whole of Hawaii, Hilo is a major port of call for many cruise ships. The lush and diverse landscape enchants visitors and the warm and welcoming locals will charm their way into your hearts. One cannot visit Hawaii without spending some time on its pearly white beaches and enjoying the sun and surf. Head to the Richardson Ocean Park to check out the black sand beach. Other key attractions include the Hawaii Volcanoes National Park, Queen Liliuokalani Gardens, a 30-acre (12 hectare) Japanese garden, or the Pacific Tsunami Museum. 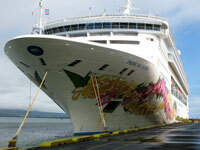 Cruise ships dock at Hilo port, which is located just a few minutes from town. Cruise passengers are often greeted by a show put on especially for their arrival where traditional Hawaiian music and dancing can be enjoyed as well as the sale of souvenirs. Cruise ships dock within walking distance of town and taxis can be easily hailed from the pier. Car rental agencies such as Hertz and Avis have offices in Hilo, but cars can only be rented from the airport, which is about a 10-minute taxi ride from the pier. Many rental agencies send courtesy shuttle buses to fetch passengers from the pier, and it is advisable to reserve a rental car before arrival in Hilo. The Pacific Tsunami Museum is a must for history buffs, while other key attractions in Hilo include the magnificent Akaka Falls, Rainbow Falls, the Hawaii Volcanoes National Park and the Lyman House Memorial Museum, which focuses on Hawaii's natural history. The Hawaii Tropical Botanical Garden is also worth a visit, not to mention the miles of pristine sandy white beaches for sun-worshippers to enjoy. Most shopping in Hilo can be done in and around Kamehameha or Keawe Avenues and passengers who are in town on Wednesdays and Saturdays should be sure to check out the Hilo Farmers Market. There are great shopping opportunities in this town and the scenic bayfront is also a great place to pick up some bargains from storefronts dating back to the early 1900s. Orchids and coffee are favourite buys, but are not always realistic souvenirs for cruise passengers to take back home.